Hope's Cafe: iMainGo2 Speakers Review and Giveaway!! I am always looking for new accessories for my Mp3 player (okay, I guess I'm always looking for new electronics, period!) iMainGo is a really neat new system that gives you the option of very powerful portable speakers at a low cost! "Founded in 2006, Portable Sound Laboratories is a leading innovator in portable speaker systems. Portable Sound Laboratories mission is to provide the highest quality, easily affordable ultra-portable speaker systems on the market." iMainGo sent me a set of their portable speakers. The iMainGo2 have a very unique system. Not only is it a very powerful speaker, but it also holds and protects your mp3 player! 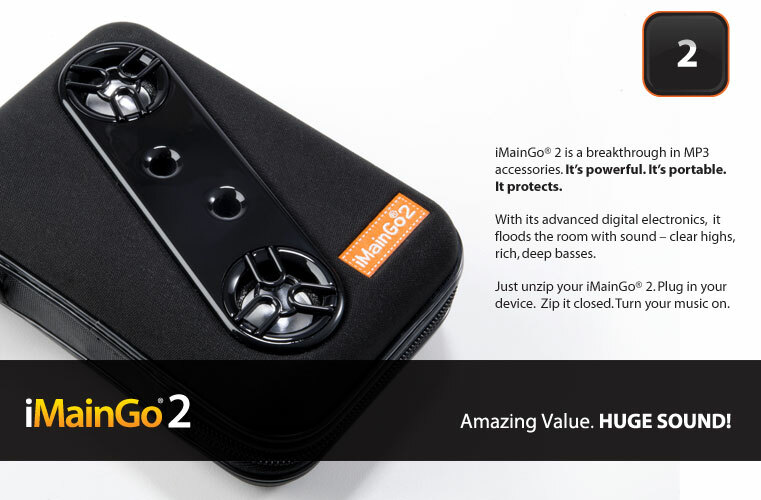 The iMainGo2 is a portable speaker that you can put your player inside for protection. It custom-fits all iPods (except shuffle), iPhone, iPod Touch, and almost any other mp3 players. There is a nice memory foam piece to fit over your player to ensure safety, and it also zips shut for maximum protection. And for such a small speaker, this delivers powerful sound! Watch this 20-second video for an example of the powerful sound...and it's not at full-volume, either! One of my favorite things about these speakers, is that it has a clear plastic plate in the back. That means you can see and control your mp3 player without having to take it out of the speaker! Inside...note the memory foam on the right. Easy control and viewing through the clear back! "State-of-the-art electronics deliver bigger and better sound than systems many times the size. Premium high output stereo speakers, tuned porting for amazing bass reproduction and ultra-efficient digital music amplifier." I am impressed with how long a set of batteries lasts, too! I have used my iMainGo2 a lot, and it is still running as loud and clear as when I first put the batteries in! Estimated battery life is up to 30 hours. iMainGo is giving one of my readers their very own iMainGo 2 speakers! Go to iMainGo and tell me what you like best about the iMainGo 2! This giveaway ends Monday, October ,4 2010 at 11:59 p.m. Please leave a valid email address in each comment, as this is how the winner will be notified. Winner will have 48 hours to respond, or another winner will be chosen. Giveaway open to US residents only. Disclaimer:I received product for the purpose of review. All thoughts and opinions are mine. All quotes taken from the iMainGo website. I love it that you can use it with portable gaming systems, cell phones, etc. also. I like that it has a one year warrenty, removable strap and Wake up to music with built-in alarm feature. I like that the iMainGo 2 zips your mp3 player up and that you can still control it without taking it out again. It can hold 30 hours of playtime, wow! Neat. I LOVE that the iMainGo 2 protects. I would love to win this! !